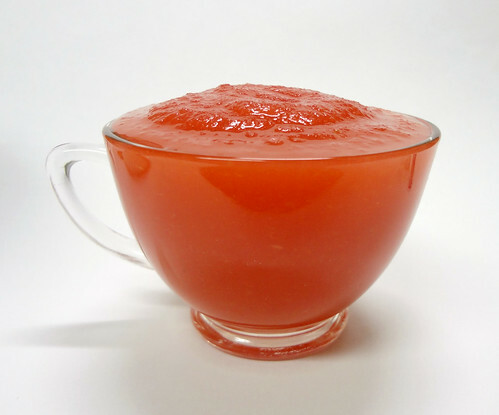 Today’s recipe for rosy Applesauce comes to us from the Stir-Ins and Pour-Ons section of Kool-Aid Comes of Age. And we did indeed stir something in. 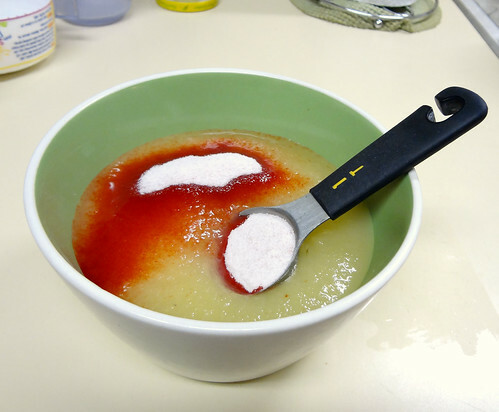 Not a very complex recipe, Rosy Applesauce calls for adding some sugar-sweetened Kool-Aid to applesauce. I went with Strawberry as it was within the bounds of the “any red flavor” directive. This recipe was unnecessary. Applesauce is great. And preparing this made me realize it’s been a zillion years since I’ve had any. 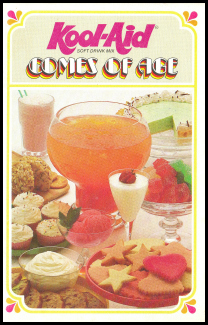 The two tablespoons of Kool-Aid didn’t really add a whole lot to the overall flavor experience. The applesauce still came out on top. 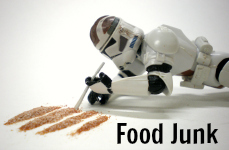 What it did do was ramp up the already sweet applesauce to unenjoyable levels. That could’ve been my fault though. I guess I should have scouted for some applesauce that was not so sugar heavy. I didn’t know! I just grabbed the Mott’s. It’s a time honored product! Maybe an unsweetened envelope would’ve worked better. The presentation left a little to be desired as well. 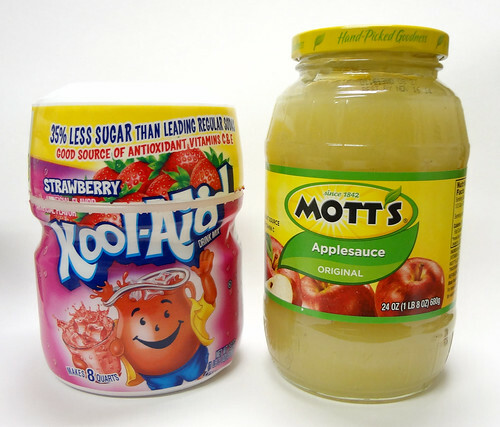 If they were smart they would’ve said to split the applesauce in half and Kool-Aid up only one of the halves, then mix them together for a cool swirly swirl. I know! I’m so good at this! I should host more dinner parties. Also, I don’t think this needs to be restricted to any red flavor. I’m sure other flavors would be just fine. Those poor suckers didn’t have the bevy of flavors and hues we have now. Break outta the seventies man! We’re goin’ to Mars! This entry was posted in Stir-ins and Pour-ons and tagged applesauce, cold, Kool-Aid, recipe, strawberry. Bookmark the permalink.